An 8-year-old is learning principles of science in front of a cooking flame. A 6-year-old is toning up on a treadmill during gym period in school, and a 7-year-old has a coach giving her lessons on how to survive (and thrive) in life. A 12-year-old, meanwhile, is taking fast steps towards adulthood with an early start to his JEE preparation. With learning and lifestyle concepts changing fast, kids of today are becoming familiar with the grown-up life much before growing up. It has its rewards, but there are pitfalls too. Alvira moved to Gurgaon with her family in 2017. Leaving school and friends in Bangalore was hard for the 11-year-old, who just could not adapt to her new home. She went into a shell but also developed a rebellious streak, often taunting and bullying her peers. Deeply worried, Alvira’s mother enrolled her in classes combining culinary arts with science (inspired by Harvard University’s online science-andcooking course), believing it would help soothe her daughter. In the studio, however, Alvira would be uncooperative, deliberately spoiling what she (and others) had prepared. But the changes slowly began to show; six months on, not only was Alvira mingling with her peers, she also learnt about the role heat and matter play in cooking, about molecular structure and chemical reaction, and why sedimentation is important. One of Alvira’s course mates, Ankit, enrolled for a very different reason. He loved science but was a picky eater. His parents thought the course would make Ankit less finicky about food. Today, the eight-year-old has learned to cook, and appreciation of his culinary skills from other kids in class has encouraged him to sample his own recipes as well. The ‘kitchen-lab’ is an example of how learning spaces have changed in an age of information overload and short attention spans. Rukmini Das, the educationist behind the concept, says a lack of engaging learning spaces for students has given rise to a disparity, where attention is either on super-smart children or on those with an aversion to studies. “Our programme does not believe in defining ‘right’ and ‘wrong’ for kids – they should learn while having fun and understand what they are learning,” says Ipsita Dasgupta, a teacher at the studio. But why food? “Because food is universal. Every single child and parent is interacting with food daily, to use it as a medium of learning,” says Dasgupta. And because cooking calls for planning, execution and problem-solving, Dasgupta adds, it’s ideal for equipping children with life skills. So, a typical class will focus on one ingredient, through which a student can learn several concepts. A session, say, on salt will look at how it is formed, the different kinds of salt, and even the politics of salt (featuring a history of the Dandi March). Let’s move to an outdoors classroom now. On a windy Sunday morning in February, the sky specked with gliders, drones, radio-controlled aircraft and paper planes, Joginder Singh is using a battery-operated aircraft to coach a disparate bunch — from five-year-olds to older hobbyists — about aerodynamics, aerofoils and acrobatics next to Damdama lake on a patch of green land which has a mini airstrip to land the plane models. 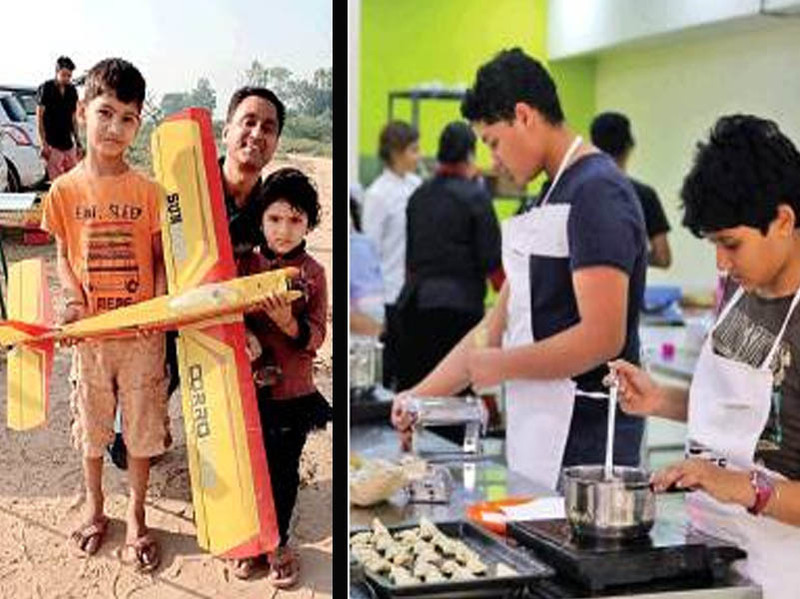 An aeromodelling instructor, Delhi-based Singh has taught hundreds of kids. “Kids learn the concepts of physics in theory at school but here they are learning it practically,” he says. From picking up basic flying rules to building models from scratch (using a Coro sheet), Singh covers a lot of ground. “Kids get very creative – I just love the gleam in their eyes when they fly the models,” he says. ‘Never chew with your mouth open, and never stuff your mouth. Hold the fork in the left hand, spoon and knife go in the right,” explains the etiquette trainer at an upmarket café in Noida. Her young wards, about a dozen of them, fiddle with the cutlery as they polish their Ps and Qs. Constrained by time, some parents are hiring professionals to teach their children how to conduct and present themselves, and how to work on their appearance. And starting early seems to be the key; consequently, four-year-olds too are being sent to etiquette classes. Not surprisingly, personality development trainers and image consultants are in high demand (especially before school admission, remember the movie, ‘Hindi Medium’?). Besides, many mothers and fathers desire for their children what they themselves could not achieve or acquire. But there is a flip side. Some parents groom their children because they aspire to a certain social standing – whether or not their daughter or son needs that grooming. In 2016, the private coaching industry was estimated to be worth around $40 billion (Source: Coaching Foundation India). This sector is growing by leaps and bounds, in both big cities and small towns, a consequence of conventional education not being rigorous enough to help crack competitive exams. Nowadays, the rat race starts prematurely, leaving kids as young as 11 and 12 (studying in class V and VI) pursuing their parents’ IIT and IIM dreams. Walking the bylanes of Kalu Sarai in Delhi, one can’t help but compare this little enclave of engineering and medical coaching centres to a mini version of Kota, the coaching capital of India. In his book, ‘Confronting the Shadow Education System’, Mark Bray highlights how this culture of coaching is not just confined to job aspirants or metros. It starts worryingly young. “You require certain competence to clear competitive exams. We fill the gaps in school education by providing parallel education,” says FIITJEE India director R L Trikha. “For class VI and VII students, we cover the NCERT or state board-prescribed curriculum. Along with that, we teach them how to develop their IQ, how to raise their mental capability and conceptual understanding. But we discourage rote learning,” clarifies this former chairperson of SAIL. “Early courses de-stress students. And when you start early, you have the temperament to crack the exams,” Trikha adds. The fitness regime for kids, too, is starting early, and in a more organised way. At a Montessori school in Gurgaon, Priyanka, 5, lifts exercise balls with her classmates during a ‘gym period’ (whatever happened to the games period?). This facility, buzzing with activity, is fitted out with a cross-trainer and body-twister machine, among other apparatus. With screen-time having replaced playtime, a worrying number of kids are at risk of obesity and high blood sugar. This has led to fitness-conscious parents looking for options to get their children to sweat it out since access to playgrounds is difficult and open play areas come with their share of security concerns. “We make the kids feel accomplished by noticing and praising their efforts – this makes them feel good, and they often want to continue the activity, or even try others,” says the school’s fitness trainer Atul. Gym exercises, he adds, also boost self-esteem. Still, there’s an obvious downside to the pressure children are exposed to at too young an age. The most common concerns of clinical child psychologists relate to gadget addiction and behavioural issues. “Academically, every parent wants their child to excel. The pressure is not from the parents always. Self-pressure, comparisons with peers, and teachers expecting kids to mug up lessons, all point to loopholes in our education system,” contends Deepali Batra, a child psychologist from Delhi. “If parents see their friends and neighbours sending kids to various workshops, they will also enrol their kids, for social acceptance, irrespective of the child’s interest,” she adds. Batra often receives requests from parents of six- and seven-year-olds to take a mental aptitude test of their child. “They want to know, ‘what career will s/ he be fit for?’ Frankly, at that age, kids need to be left to figure things out for themselves. A little child is burdened with workshops, school homework and backto-back tuitions, and becomes addicted to technology to escape all this,” she says. Childhood may no longer be carefree, but sometimes it’s helpful to know that it’s alright for your daughter or son to take a step back, and follow that which brings them joy.